Virgil Cole: That’s the law. Randall Bragg: That’s your law. Before an image even appears on screen, you can hear the galloping of horses. Their slow stride announces the tone for the hours to follow and within the first five minutes, you know you’re in for a long ride. A slow and steady pace can work easily, especially for the western genre. Only there is a difference between a leisurely gait and dragging your feet. 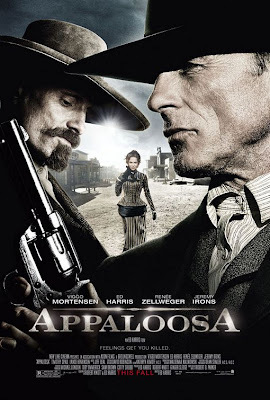 Ed Harris’s second directorial effort and first time out at the writer’s table, APPALOOSA, is a modern western stuck in a conventional frame that tries so hard to be authentic that it ends up coming across as farcical. 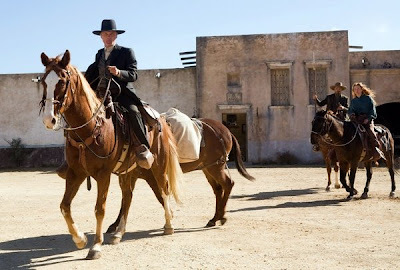 As Harris and sidekick, Viggo Mortensen, swagger down the dirt roads of their busted down town, they say things like, “Watch you don’t spook the horses,” or, “while the bees are in the butter.” All the while, you’ll shiftin’ in your spurs, waiting for the men folk to ride off into the sunset so you can mosey on outta there. Harris and Mortensen plays Virgil Cole and Everett Hitch. They are the law, or at least they are their own brand of the law, and they’ve come to the town of Appaloosa to rid it of an evil tyranny otherwise known as Randall Bragg (Jeremy Irons). Bragg basically has his way with the town and has no respect for the current law while Cole has his way with the town under the guise that he is the law. It is Cole’s job to take down Bragg and bring him to justice. He does just that with very little trouble or excitement and he must then accompany the prisoner to a neighboring town so that he may be executed for murdering Appaloosa’s former sheriff. Of course, the journey doesn’t go smoothly and of course there is an inevitable shoot out. In between all that, there is a lot of talking. Long conversations about nothing particularly relevant go on incessantly and finish long after the fields have been plowed (or in other words, the point has been made). Every turn is expected making every moment as flat as the western plains of New Mexico. Enter Renee Zellweger as Allison French. Her character is just as lame as her name and her purpose is unbearably offensive. She appears out of nowhere, descending from a train car, dressed in a costume that borders on circus clown, and her arrival announces the obvious intention of ensuring that female viewers have someone to identify with (and not just Mortensen to stare at). Recently widowed, Miss French is clearly in the market for a new man. Cole wants to fill that hole. Miss French knows a good catch when she sees one and before what seems like just a week has passed, they are buying up property and she is nagging him that he never brings his friends round for dinner. She is woman as temptress; she is woman as bothersome and controlling; she is woman as distressed damsel; and she is woman as devil that should never be trusted. Perhaps Harris and co-writer, Robert Knott, thought they were being authentic to the period but all they come across as is misogynistic. APPALOOSA is at times laughably melodramatic. It is so staged and so awkwardly paced that it often feels like amateur theatre. A central theme of men facing difficulties with having feelings, let alone expressing them, runs throughout. If only the men behind the camera had infused some actual feeling into the film, it might then have felt as though there were a purpose greater than just an excuse for the cast to get dressed up like cowboys and play with their guns.